At its essence, permaculture is about working with nature to create a better world for us all. By studying the secrets of life's success, we can derive for ourselves a set of guiding principles. Permaculture design uses these principles to develop integrated systems to provide for our needs of food, shelter, energy and community in ways that are healthy, efficient and sustainable. Using Permaculture design we can improve the quality and productivity of our individual lives, our society and our environment. Earth care - enabling all life systems to continue and increase. Fair share - voluntary limits to population and consumption; to share resources for Earth care and People care. Permaculture is a way of designing systems, to maximise yields using the least effort. While it can be creatively used to design almost anything that we do, it is at present most commonly applied to food production, I will therefore give an overview in relation to food systems. Our current farming systems are very energy-intensive, either through the use of heavy machinery, fossil fuels, chemicals or manual labour. Not only are these unsustainable in energy terms, but they are also rapidly degrading our soils and in turn the nutritional value of the food that we grow in them. While natural systems cycle back nearly one hundred important elements into the soil, NPK fertilisers put back three! The end result of such practices is plain to foresee. We need to re-evaluate the way we grow our food urgently! While the current trend back towards organic farming and gardening is a step in the right direction, any system of mono-culture (planting large areas with a single crop) will always be a struggle against nature's unstoppable tendency towards bio-diversity. Thus 'organic' in itself is still not the answer. We need truly sustainable systems and Permaculture can help us to design them. So when we design food growing systems, we ask ourselves "How would nature do this? What kind of wild flora and fauna live here, and what adaptations have they made to become successful?" As I'm sure you've noticed, large areas of a single species are not commonly found in nature and while a mono-cultured grain field may look full, it occupies only one level in terms of height and depth. Observing nature has shown us that there may be seven or more distinct vertical layers of plants and trees in any stable ecosystem, with a variety of rooting depths drawing up nutrients from all levels within the soil. This process is ultimately beneficial to all species growing and living there, as all these nutrients are eventually recycled back into the topsoil. Diverse systems do not suffer 'crop failures' (which can of course be disastrous with single crops, leading to mass famine at times). Their more stable microclimates ensure that there are always some species that are doing especially well at any given time. Fungi perform many important roles within nature, some decomposing dead matter to make new raw materials and others growing in cooperative relationships with plants, trees and insects. Insects also have many cooperative relationships with plants; for instance by exchanging pollination service for food. Cooperation abounds in nature and is what holds natural systems together. Even where one animal predates upon another, the prey are reliant upon the predator to control their numbers and ensure that the fittest genes get passed on to the next generation. Animals are of course vital to any healthy eco-system, but in the wild they are always on the move. Grazing animals, regularly tracked by predators, travel in large groups for safety, and this pattern allows grassland time to recover in between grazing. If we are to include large herbivores in a system, we need to keep moving them around, or the sward (mat of roots) that protects the soil gets broken up. Soil compaction or erosion soon follows and once this has occurred, a lot of energy is required to rebuild the structure of the soil. Permaculture systems have already been designed and applied successfully in all the different types of climate around the World, in many cases restoring productivity to land previously made barren by mono-culture systems and allowing people to feed themselves again. For most of us, bringing some Permaculture design into our own gardens is a first but very important step that we can all make. At home we can create a low-maintenance, attractive environment that can also provide us with a significant quantity of fresh, nutritious food. All we need is the know-how, plus better access to a few plants and trees that aren't yet easily available. Permaculture is something that we can all learn relatively easily; a lot of it is just common sense that we hadn't thought of before. It provides us with the tools to help us make the right choices for our particular situation and then connect those things together in the most beneficial way. Once we understand the basics, everything else builds upon those principles and we become part of the worldwide group of people learning by simply living it. Whilst Permaculture is relatively new (about thirty years), it is modelled on a system that is as old and successful as life itself. Permaculture is a rapidly growing science, with more and more being learned all the time to fine-tune the design process. Permaculture works, as established designs clearly demonstrate, but then this is hardly a surprise as nature has plenty of time to get it right. This can only be a quick introduction and permaculture can be applied to many systems, it's not just gardening! 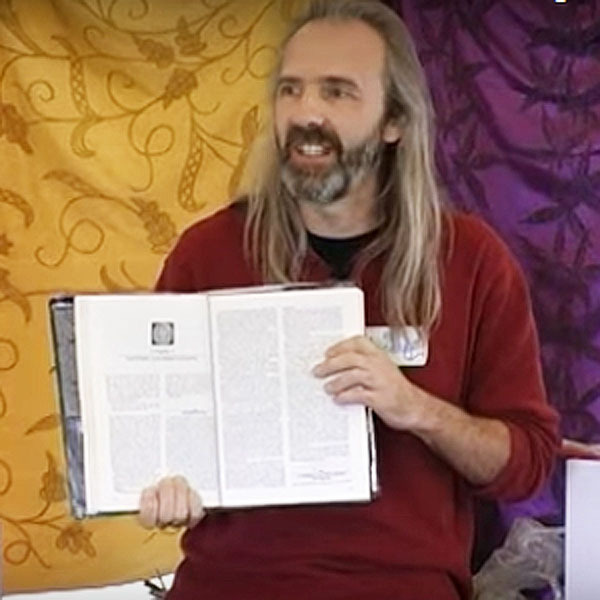 A much more in-depth description of what Permaculture is about can be found in the many books that have now been written on the subject. There is also more to be found on the World Wide Web. 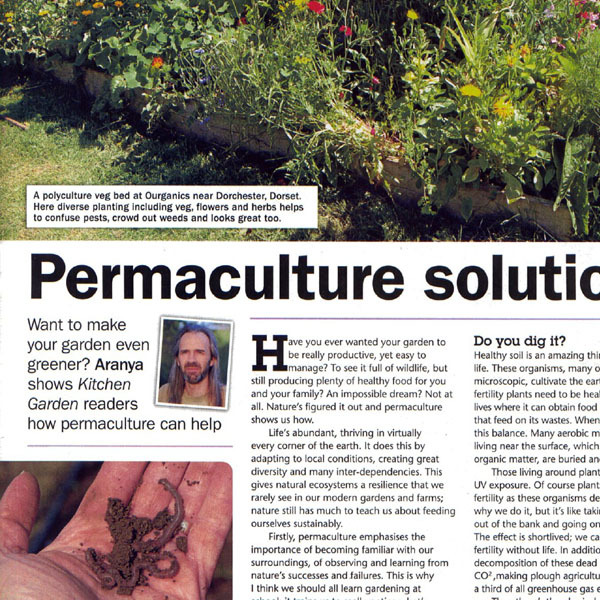 There is another good introduction on the About Permaculture pages of the Permaculture Association (Britain)'s website. The very best way to learn permaculture though is by taking a course. Check out the different types of course that we offer, from beginners to advanced. Browse through a collection of Aranya's magazine contributions. "Permaculture is revolution, dressed up as organic gardening"